Founder and CEO of Y-Axis Overseas Careers, India's No.1 Overseas Career and Immigration Consultant. I live in India. Am 42 years, married with 2 daughters. Love travelling and people photography. Share your stories with the world here. Ladakh. Beautiful, effervescent, colossal and mesmerizing. Gorgeous monasteries, snow capped peaks, burning sun, freezing winds, stark naked mountains and lush green valleys- a destination right out of a vivid fantasy. When a couple of my friends contacted me to ask whether I would like to join them on a trip to Leh, I jumped in joy and did a happy dance! (I also may have fallen and sprained my ankle while attempting to dance, but that’s not important!) Leh has always been on the top of my wanderlust wishlist (Leh, Rajasthan, the Seven Sisters and Ireland!). An instant yes and a couple of tedious and tiresome months of waiting later, we were all set to board a flight from Pune to Srinagar. A total of 9 people, half the group members were unknown to me. However, a few rounds of antakshari proved to be the perfect ice breaker and we all got along like a house on fire! The Leh travel itinerary was simple. Day 1- Arrive in Srinagar and straightaway drive to Sonmarg. Day 2, travel to Leh. Day 3- Spend the day in Leh acclimatising. 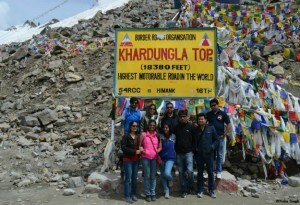 Day 4 was for Leh-Nubra Valley journey via Khardungla Pass. Overnight stay at Nubra Valley. After a return journey to Leh, day 6 was for Pangong Lake. Overnight stay at Pangong Lake. Day 7 was reserved for the return journey to Leh from the lake. Day 8 was Kargil. Day 9 was for Kargil- Srinagar-Pune. Looked perfect and simple enough to be carried out to the tee. But nature had its own plans! The day we reached Leh, it started raining heavily. Infact, our hotel staff told us that it hadn’t rained so much in region since ages! Due to the downpour, landslides had blocked approach roads towards Nubra Valley as well as Pangong Lake. And so we were stuck in the town for a couple of days. It was like Leh did not want us to leave its motherly shelter. As a saying goes, ‘there’s no use trying to rush fate, because the best things in life are worth the wait’. Luckily for us, it never rained throughout the day and we could make the most of this bad situation. We rented Royal Enfield bikes, wore our safety gear and explored this fantastic town at our own pace. We shopped like crazy, rode up to the Shanti Stupa, climbed up to the Kali Mata Mandir situated within the Spituk Monastery campus, visited the humbling Hall of Fame, explored Leh Palace and gorged on mouth-watering Ladakhi food. But there was only so much we could do without being bothered by the feeling of helplessness. And so, one day, having decided to leave Leh, we convinced our driver Mr. Dorji to take us to Pangong Lake, or atleast to the point from where authorities were sending travellers back due to road blockage. This time, fate was on our side! By the time we reached the checkpoint, the roads were cleared and were open for travel! After a thrilling ride full of deadly curves and blind turns on a not so smooth road, we got the first glimpse of Pangong Tso and we were left speechless. “Beautiful” someone exclaimed, “mesmerizing” said someone else, “magical”, “is this for real?”, “are we on the same planet?”, “huh?! Am I dreaming?” followed! The truth is, Pangong Lake is beyond description. No words will ever do justice to its beauty and vastness. If only Shakespeare were alive today, he would have invented a word fit enough to describe the Lake! Or maybe even he would have been at a loss for words! Very few people get to see the beauty of the lake. Located remotely, reaching it is a tough task. And that’s what makes the journey even more special. Pushing your limits, traversing rugged terrains and then being welcomed by such a stunning site- the journey is definitely worth it. Our tent accommodation was right near the lake. Just picture this. Sitting in the night near a cozy bonfire, under the light of a million stars, with an almost full moon’s shimmering reflection in the lake as a backdrop. Yes. That’s what we got to do! The bonfire has since been extinguished, but the memories of that night still linger on. After a memorable time at Pangong Lake, we left for Leh. Due to lack of time, we could not cover Nubra Valley, but we did go to Khardungla Pass- the highest motorable road in the world. At that high an altitude, I started getting a throbbing headache inspite of taking proper medication. But, a bowl of Maggie and a cup of Kahwah later, I was back to my normal self! We had to skip our stay at the stunning Kargil town as well. However, we did pay homage to the brave souls lost, at the Drass War Memorial. The memorial is a humbling reminder of the fact that we all are safe in our homes because of the sacrifices of thousands of army men. A reminder that freedom is not free, it has to be fought for. We could not spend a lot of time in Srinagar. A quick shikara ride later, we all headed towards the airport to board our Shrinagar-Pune flight. This was the end of our journey. Inspite of having a wonderful family, fabulous friends and a dream job, I sometimes complain about my life. But, after meeting people who have been away from their loved ones for months on end, be it our driver Mr. Dorji, the shopkeepers in Leh or the many shepherds we met on our way to Leh, I realized the value of my easy lifestyle. I don’t have to sleep in the open in subzero temperatures. I don’t have to climb mountains barefoot and I definitely don’t have to go without having a bath for days on end! Meeting such fabulous and modest people was definitely an eye opening experience. We travelled because we wanted fun, adventure and a break from monotony. But we found what we needed. We found solace. In each other. In ourselves. We travelled through different states, different regions and different religions. And through it all, we found humanity. I quote Mary Ritter Beard, “Certainly, travel is more than the seeing of sights. It is a change that goes on, deep and permanent, in the ideas of living”. About the author: Niyati Shinde is in love with life. Travelling, trekking, reading and writing are her passions. Her wanderlust takes her places, shows her beautiful sights and lets her meet amazing people. She also has an ebook of short stories available online. INITIAL signs were not promising. As I emerged from the Sant Antoni metro station on a warm Barcelona afternoon in search of the Market Hotel, a place I had booked a few days earlier on the Web, I was confronted by a busy commercial thoroughfare anchored on one corner by a ramshackle market selling everything from espadrilles to salted fish and on the other by an unpromising-looking cafe populated by a lone elderly man sipping coffee and flipping idly through a newspaper. I am going to begin this website with a column called “Viswa’s World” by ViswaPrasad Raju, (an ad man by day, a travel enthusiast, a nature lover who also loves to sketch). I will read more into the coincidence that he unwittingly send me an e-mail today (on the day it was going alive) inquiring if ‘Been There Done That’ which began and exists as a FaceBook Page has a website. Viswa, here it is. And I invite you to use this platform to express your creativity, archive your work and share it with the world. And for you reader, unless your trip was an espionage, we would love you to share your experience with us.